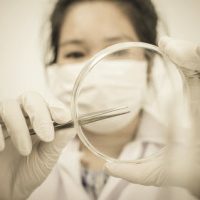 In this day and age, many couples are having children via assisted reproductive technology (ART), but sometimes there are loopholes left in the property rights to the genetic material used to do so. In a community property state such as Nevada, debates over ownership of embryos or gametes can be a difficult issue, especially since the ‘asset’ is of such a personal nature. Consulting an attorney who understands both Nevada divorces and the law surrounding ART can be a good way of resolving the matter. Normally, under Nevada law, an “equal disposition” of the community property of the parties is made during divorce proceedings, meaning that all the property acquired during the marriage, is divided as close to equally as possible. There may be good reason for a court to make an unequal division of the community assets, but if this does happen, the court must establish the reasoning on the record. As one can imagine, the usual procedure for asset division in Nevada divorces can be problematic in the case of genetic material, such as frozen embryos. An embryo only needs to be implanted in order to start growing into a child, and having a child is a life-changing decision. If ownership of an embryo is given to one spouse during a divorce, the other spouse is effectively shut out of the decision being made as to the fate of that genetic material. Public policy and privacy rights dictate that no one should be forced to become a parent against their will, and if, for example, a wife is granted possession of the embryos and goes ahead with implantation, her ex-husband might be placed in exactly that position if a genetic link can be established. On the other side of the argument, an existing embryo may be a person’s only chance to have a biological child, such as the case of a person who has undergone cancer treatment, and public policy may support awarding an embryo to this spouse. Despite the strong arguments against allowing embryos to be used in the event of a divorce, the law on this issue is not uniform. Nevada has no reported case or statute which is relevant as of this writing, but cases across the U.S. have been decided in conflicting ways. Contract principles have come up in cases involving such issues, especially if there has been some kind of form or agreement signed as to the disposition of genetic material in the event of a divorce, but courts cannot seem to agree on whether such forms are binding – cases from California, Pennsylvania and Washington have all arrived at varying outcomes. There is also another question that courts have not yet addressed satisfactorily as of this writing: at what point does an embryo cease to be property and start being a living entity? Both legal and medical questions are raised in these types of cases, and while no answer is possible currently, it is not implausible that a standard might be worked out in the future. In the interim, it is generally a good idea to seek out an attorney if such an issue comes up in your divorce proceedings, as these cases are unusual and best handled on a case-by-case basis. ART is a relatively new field, with complex legal issues that may cause significant confusion and delay in your divorce proceedings if not addressed properly. The Las Vegas lawyers at the Kainen Law Group have experience in these sensitive matters, and we are happy to try and help guide you toward a result that will be appropriate for all involved. To schedule an appointment, contact our offices at 702-823-4900 today.